THE COLLECTION HAS FOUND A PERMANENT HOME! On the 22nd August 2018 The Hypatia Trust officially handed over the Elizabeth Treffry Collection to the Morrab Library, where it can be read and enjoyed by all in a dedicated room. The Elizabeth Treffry Collection (ETC) contains over 3000 books and artefacts that document the lives and works of women in Cornwall and the Isles of Scilly. It is one of the ‘special collections’ of the Trust and will remain in perpetuity in Cornwall. The collection spans fiction and non-fiction works and it will play an essential part in rebalancing narratives about Cornish and Scillonian history and literature. ETC is an exemplar project for recording, researching, preserving and promoting women's heritage in other under-represented regions of the world and will encourage replication. We also hope that improved access to such collections will provide young women and girls with the historical role models they need to feel confident and to achieve their potential. This wonderful collection is available to the public at the Morrab Library in Penzance, Cornwall's only independent library. SO WHO WAS ELIZABETH TREFFRY? Dame Elizabeth Treffry, according to medieval legend, was an aristocrat based at Place House in Fowey and renowned for heroically and successfully rallying troops and defending the town during the French raids of 1457. Her strategy was allegedly to pour molten lead over the rascally raiders. Her feats were immortalised in the poem ‘The Lady of Place’, by Henry Sewell Stokes (1884). 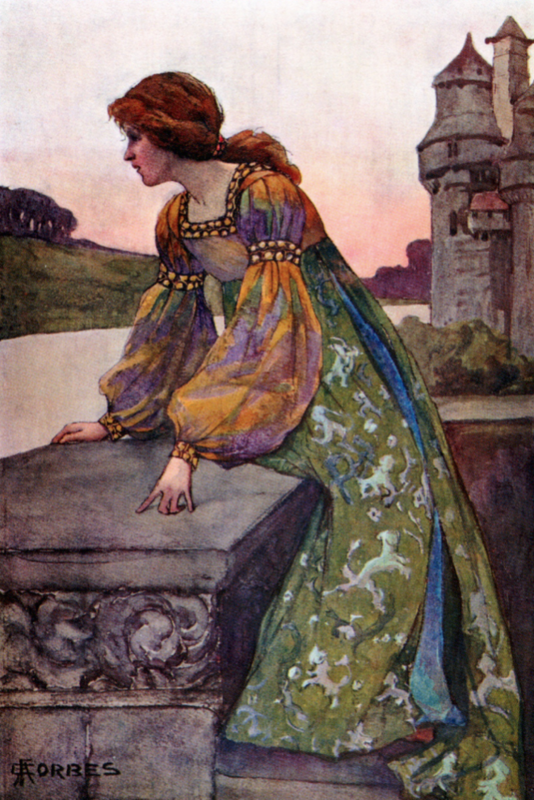 The illustration above is by Elizabeth Armstrong Forbes and is reprinted from King Arthur’s Wood (1904). We recently celebrated her life in her home town of Fowey during our History 51 Sea Women community history event. Launched first in 1988 at the Jamieson Library, Newmill, the opening speakers for the event included the late Hon David Treffry, then the remaining descendant living at Place House, Fowey, Professor Charles Thomas, and Professor James Gibson of Dorset. In 2002 the Collection moved to its new home in Trevelyan House, Chapel Street, Penzance. Its development and promotion has been supported by internal funding of the Trust itself, and external funding from the Arthur Quiller Couch 'Q' Fund of Cornwall County Council (now Cornwall Council), the Cyprus Well Grassroots Literary Development Fund (now Literature Works, SW), the Heritage Lottery Fund and the Tanner Trust. Dr. Tehmina Goskar conducted a Collections Audit in March 2012. Read the report: Curating the Elizabeth Treffry Collection. In 2016 on International Women's Day, March 8, ETC opened its doors at the Krowji Creative Centre, Redruth. It can be visited by appointment with Azook CIC (see above for details,) the community interest group and digital resource, who are completing our digitalization for listing on-line. In 2012 the Trust won funding from the Heritage Lottery Fund to run the History 51, a public engagement project to promote women's heritage in communities across Cornwall. The aim was to generate a following that would then be interested in using the Elizabeth Treffry Collection for their own personal and scholarly research. The project formally ended in December 2013, but will continue via Hypatia: Cornwall's Women – recognizing and promoting women’s lives and works in Cornwall. We have also begun to digitize and make available key works. In Autumn 2013 we digitised the stunning (but unwieldy) volume King Arthur's Wood by Elizabeth Stanhope Forbes (1904) and made it available to iPad uses via the iBookstore. Our original copy has now been deposited with Penlee House Art Gallery and Museum as their storage and exhibition facilities are much more appropriate for such rare material than our own. With matching project funds from the Tanner Trust, we began in January 2014 to catalogue systematically the ETC in order to improve access to its holdings. This is an important stage in the life-cycle of the collection, making it ready for a fully-documented donation to an existing public institution in Cornwall. At the moment our collecting is reactive and we receive several donations from generous authors when they publish a work relevant to our collection. However, given the appropriate resources we continue to welcome holdings in the following areas, relevant to women in Cornwall and Scilly, and general reference material such as dictionaries and encyclopaedias.